The sales process is the mainstay and one of the most important processes of every organization. Arrangement, optimization, monitoring and controlling the sales process are necessity for every company, as part of its regular activity and financial development. Hyper was designed and customized for the real and the contemporary business world and is a simple solution for any kind of sale process. This innovative system can price the order, determine the production process and display the sale process according to the organization needs and requirements. The sales processes of hyper were created and design according to the common needs and requirements of a wide range of organizations and businesses. The sales module is one of the most important functions that executes the sales processes and manages the clients accounting, from the price offer, through the orders creation and until the final payment and the delivery of the goods. The sales process of Hyper uses both CRM and ERP systems. Private Price List - Private price for the client, for selected products / services. The private price will replace any other price of this product / service. Committed / Prepaid Products - Define and display the prepaid Products / Contracts, as well as limited quantities or time limitation for specific orders. Monthly Billing for Services - Monthly billing of clients for permanent or temporary services. 3rd party Billing for Services - Displays the billing records from 3rd party systems. Orders - This tab is used for managing the orders of the client, from the price offer through its approval and to the production. The system allows to update the status of the order, modify its details and to execute additional related actions. For further information, click here. Carry Out - This tab displays all of the approved orders, the ready quantity to supply, quantity on delivery note, quantity on tax invoice, and any additional information according to the user needs and requirements. This tab is used by the relevant managers and employees to verify all of the above. For further information, click here. Delivery Note - This tab displays the delivery notes of the client and allows to produce new delivery notes for exist orders and for any product that was not related to the client's orders. For further information, click here. Tax Invoice - Produce tax invoices for sold products and services. Tax invoice can include products and services from several Orders / Delivery notes. For further information, click here. Receipt - Produce formal document of receipt when receiving money from a client. For further information, click here. Return of Goods - Report items that have been returned by the client. The system allows to produce a formal document for the returned items. For further information, click here. Credit Tax Invoice - This formal document represents partial or full cancellation of a deal, for the tax authorities. There are three optional available credits: Simple credit, Credit for a tax invoice, credit for a prepaid products / services that have not been delivered to the client. For further information, click here. Refund - A formal document that represents a return of money to the client. This is the opposite document of Receipt. For further information, click here. C.C. Log & S.O. - Save the details of the client's Credit Card / Standing Order for Auto Billing. The information is encoded by hyper (in PCI DSS standard). For further information, click here. Last Price - This is a statistical report of the prices of the sold items (for this client). This report includes the rejected price offers. For further information, click here. 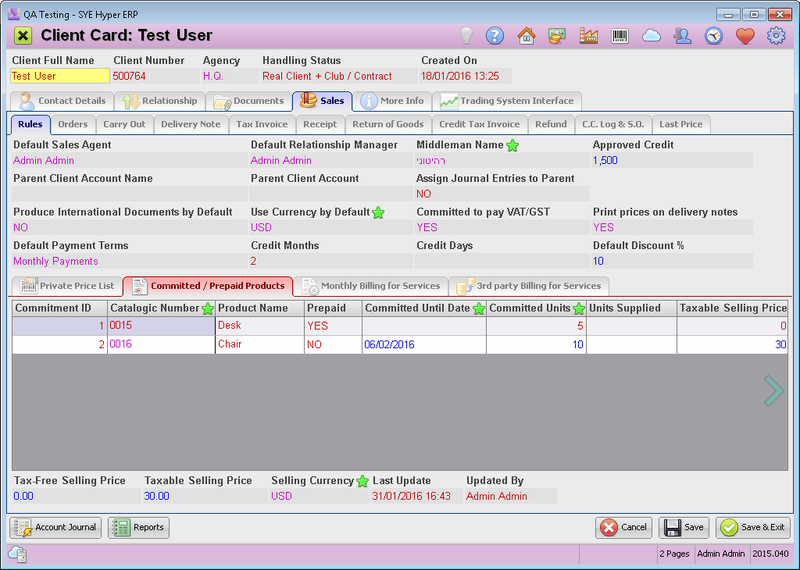 The rules tab is the main tab of the Sales module. 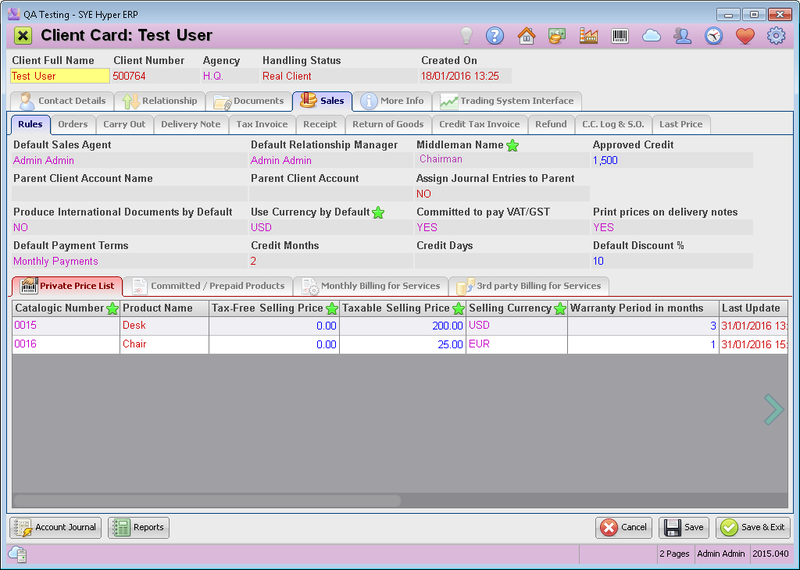 In this tab, the user should define all of the accounting rules and terms for the client. This tab also includes commitments and agreements, Private price list, committed / prepaid products, Monthly billing for services, 3rd party Billing for Services. Each of the above definitions is defined in a different sub-tab, as will be described below. Middleman Name Choose the middleman from the list of suppliers. A middleman can be related to a client card for future commission calculation. Approved Credit This is the approved credit limit for this client. The system will alert the user for any violation of this definition. Parent Client Account Name When one client is related to other client (e.g. holding company, subsidiary company), the system allows to create a linkage of these clients cards and accounts. In this case, choose the parent client card from the list of clients in this field. This client card will be automatically defined as a "Child" in the parent client card. Assign Journal Entries to Parent Choose whether to assign the journal entries of this client to the parent client account (as defined in the "Parent Client account Name" field). Still, this "child client" name will be printed on every formal document that will be produced. Produce International Document by Default The system autocratically works in two languages: the local language and English. Therefore, the system allows to produce every formal document in English, when choosing to produce an international document. Use Currency by Default The default currency is the local currency, as was defined in the "Sales" tab of the System Fundamentals. A different foreign currency can be selected from the list. Committed to pay VAT/GST Define whether the organization is committed to pay VAT/GST, according to the local regulations. The default value is "YES". Print prices on delivery notes This definition is also applied to "Return of Goods" documents. Please note - There is no option to hide prices for international documents. Cash - Cash payment for every given product / service. Standard Credit - Credit payment. Fill in the "Credit Months" and "Credit days" fields with the required value. Extra Credit - The client will pay at the beginning of the following month, and after the additional months / days, according to the value of the "Credit Months" and "Credit days" fields. Monthly Payment - The amount of payments should be defined while creating a new tax invoice for this client. Consignation - The client will pay only after selling the received goods. Please note - these deals will not be calculated in the income forecast reports. None - No default terms of payment. Please note - these deals will not be calculated in the income forecast reports. Private Price List - This table allows to define a special individual price for selected products / services. For more information, please read the next section. Committed / Prepaid Products - Define and display the prepaid Products / Contracts, as well as limited quantities or time limitation for specific orders. For further information click here. Monthly Billing for Services - Monthly billing of clients for permanent or temporary services. For further information click here. 3rd party Billing for Service - Displays the billing records from 3rd party systems. For further information click here. This is the main sub tab of the "Rules" tab. This table allows to define an individual price for products and services. This price will replace any other price of this product / service. The table displays all of the special prices of the client. Press Ctrl+Enter to add a new row. In the "Catalogic Number" field, select the required product from the list. Tax-Free Selling Price - as defined in the product card. This value can be modified for this client only. Taxable Selling Price - as defined in the product card. This value can be modified for this client only. Selling Currency - Please note, when changing the currency, the price will not be changed and should be manually modified according to the selected currency. Warranty Period in months - as defined in the product card. This value can be modified for this client only. Last Updated / Updated By - These fields are used for following up the modifications of these definitions. When creating a new price offer, the client will have the private price. This sub-tab is used for defining and updating prepaid Products / Contracts, as well as limited quantities or time limitation for specific orders. This table displays the commitments between the client and the organization for supplying a required quantity of products for a special rate and for a defined period of time, and also displays the list of prepaid products. Please note - the system automatically uses an exist commitment at the moment of changing the order status to "Send to Production". In this case, the system will ask the user to choose whether to use this commitment for the product and for how many units. Create a new Order / Offer Form. 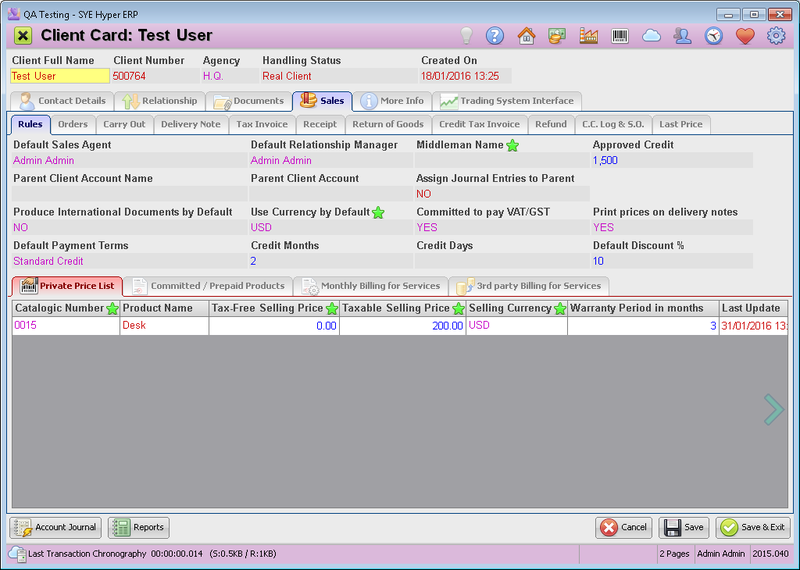 When changing the order status to "Send to Production", the prepaid items will be displayed in the "change order status" window, at the bottom table. Double click an item at the top table, that was prepaid (or has a special contract / commitment) and press the Select button. Alternatively, Press the Assign to Contract button, to use the committed units. The supplied units will be subtracted from the committed units and will be added to the "Units Supplied" field in the "committed / Prepaid Products" tab of the Client Rules. The pre paid products will be automatically added to this table and can not be removed. Add a new row by using Ctrl+Enter. Select the required product from the list, in the "Catalogic Number" field. Fill in the "Committed Until Date" or "Committed Units" fields. The commitments can be removed by the user at any time. Also, a commitment will be automatically removed if the last limited unit was ordered, or according to the date limitation. In order to use these committed products ,follow the instructions of the previous paragraph. Hyper allows its users to charge clients for a service, on a monthly basis. This kind of contract can be limited by date or permanent. Service Started From This is a mandatory field. The system automatically calculates the monthly rate from this date on, and will charge the client on a monthly basis. Service Ends At Fill in the required date to end the service. If there is no required date, leave this field empty. Monthly Repeating - under this logic, the service will be given to the client every month until the user stops it. The client will be charged relatively, according to the amount of days in each month. Fix Price Repeating - under this logic, the service will be given to the client every month until the user stops it. A partial month will be charged for the full monthly price. One Time Event - This is a one time service with a one time charge. In order to define several services, add a new row for each service. The Monthly repeating charging is available for products and services with / without Catalogic number. Hyper can calculate the price according to the definitions of this table and charge the client. The detailed list of these services and charges, can be found in the Auto Billing tab of the Toolbox (Bookkeeping Module). This table displays the charging records from 3rd party systems (not Hyper). These billings can be loaded to the system by a special foreign module which receives the billing details from other systems and into Hyper. Hyper can produce Tax Invoices and other formal documents according to the received data. The detailed list of these charges can be found in the Auto Billing tab of the Toolbox (Bookkeeping Module). In order to allow the users to define a Prepaid products while creating a new Tax Invoice, go to the "Orders" tab of the "System fundamentals". In the "Enable Prepaid Products" select "YES". This definition will make the "Prepay for a product" button available in the Tax Invoice tab. Bookkeeping Currency Mandatory field. Choose the local currency, according to the organization's accounting books. Download Currency Rates at Define the daily timing for downloading and updating the currency rates. The rates will be updated according to the Data source of the "Operative Currencies" table in this tab. Do NOT Round - Do not round the total sum. Round - The total sum will be rounded up, for a decimal part which is bigger than 5. Truncate - The decimal parts will be removed. for example: 150.8$ will be changed to 150$. Required Client ID beyond Total Amount LC According to the local regulation and the organization's policy, define the total minimum amount to require client ID. The Producing User - According to the agency of the producing user. The Clients Agency - According to the Clients Agency. NO - Do not copy any Sale Docs agents. Default Sales Agent - Copy the Sales Agent as defined in the client card. Default Relationship Manager - Copy the Relationship manager as defined in the client card. Spare Agent - Copy the required Spare agent field as was defined in the client card. 7.9. C.C Log & S.O.